Drawing on market-level information, readers are encouraged to recognise the supply and demand drivers and modelling of dynamic housing markets at various spatial scales and the implications of trends within an urban and regional context, e.g. urbanisation, ageing population, migration, digitalisation. With research-based discussions and coverage of relevant literature, this is an ideal textbook for students of residential real estate, property and related business studies courses at UG and PG levels, as well as a reference book with research topics for researchers. This book will also be of interest to professionals and policymakers. 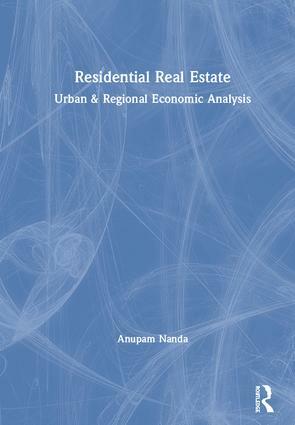 Anupam Nanda is Professor of Urban Economics and Real Estate, and Research Division Lead (Real Estate & Planning) at the Henley Business School, University of Reading, UK. Anupam grew up in India, and before joining the University of Reading, he worked with Deloitte & Touche in Mumbai and the National Association of Home Builders (NAHB) in Washington, DC. Anupam has also taught undergraduate Economics and Public Finance at the University of Connecticut, US, from where he obtained his PhD in Economics. Anupam holds professional fellowships of FRSA (Fellow of the Royal Society of Arts), FRGS (Fellow of the Royal Geographical Society), FRSS (Fellow of the Royal Statistical Society) and FHEA (Fellow of the Higher Education Academy, UK). His academic papers have been published in leading journals including Journal of Urban Economics, Regional Studies, Energy Economics, Energy Policy, Review of International Economics, Real Estate Economics and Applied Linguistics.